Looking for a game that will unite instead of divide your family? How about one that includes collaborative play with every player working together toward the same goal? 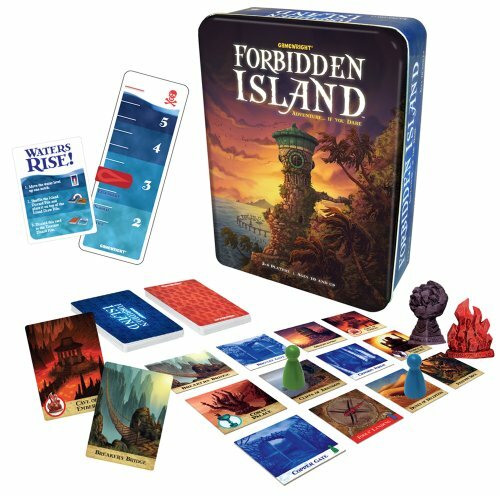 Forbidden Island is an exciting cooperative game for two to four players. It pits a team of adventurers (the players) against an island. The adventurer’s quest is to find four ancient artifacts on the island. The trick is the island is rigged to sink if anyone tries to take its treasures! The adventurers have to work together to find all four artifacts and make their way safely back to their helicopter to escape the island before the water rises. Sounds pretty exciting, right? It definitely is and it’s no surprise why. The game was invented by Matt Leacock, the designer of another suspenseful game Pandemic. The game is rated for ages 10 plus but we think kids a young as 7 could grasp the gameplay. It’s easy to learn, challenging, and can be played pretty quick which is great for the attention spans of younger kids. Gameplay takes about 30 minutes. There is no board. The game consists of 24 island tiles, a water meter, 58 cards, 4 treasure figurines, and 6 pawns (play pieces) with corresponding Adventurer Cards. All game components come in a tin the size of a standard hardcover book. Teaches strategic thinking, problem-solving, and cooperative play. The game components are all high quality. The island tiles are made from sturdy cardboard with rounded corners. The art on the cards and tiles is beautiful and it creates an authentic island atmosphere for the game. The island is created by first shuffling the tiles then placing them in rows that resemble an island. This makes the “board” different each time you play the game. Each tile has a corresponding flooded version in the 24 card Flood Deck. Each of the tiles represents a location on the island. After the board is created, 6 of the Flood cards are flipped over. As cards are drawn from the flood deck throughout the game, the corresponding tile is then flipped over to reveal the blue tinted version. This represents the location being flooded. If a flooded tile (or location) floods a second time via another of the same Flood cards being drawn later in the game the location essentially sinks. The tile and corresponding Flood card are then removed from the game. Players select (or are dealt) 1 of the 6 Adventurer cards and then place their corresponding pawn on the assigned tile location. The Adventurer cards designate each player either a Diver (black), Pilot (blue), Engineer (red), Explorer (green), Messenger (white), and Navigator (yellow). Next, 2 treasure cards are given to each player and the treasures or artifacts are placed on the board. Each treasure can be claimed at 2 different locations. Last, the water level is set on the water meter, it can be set higher or lower depending on the desired level of difficulty. The higher the water level the harder the difficulty. Every Adventurer card has a power that the player can use in the game. Here are some examples; the Engineer can shore up 2 flooded tiles as 1 action, the Pilot can move to any tile on the island once a turn for 1 action, and the Messager can give a Treasure card to a player without being on the same tile. These powers are very important to succeed in the game. Make sure you use the Adventurers powers wisely! After a player takes 3 actions they will then draw 2 Treasure Cards and a number of Flood Cards that is equal to the current water level on the Water Meter. The Treasure Cards are key to winning the game, and there are 4 treasures that the players must capture. Each of the “treasures” represents 1 of the 4 elements- Earth, Air, Fire, and Wind. The players have to capture 4 of the same elemental Treasure Cards (eg. 4 fire) and then move to 1 of the 2 locations on the island that match that element; gardens for Air, caves for Fire, and so on. Then, a player can use 1 action to give up the 4 cards and capture the Treasure. There are helpful cards mixed in the Treasure Cards deck like the Sandbag card, which can be used to shore up a tile any time not having to use an action to do it. But, there are Water Rise cards mixed in the deck as well which are not helpful at all! When Water Rise cards are drawn 2 things happen, the Water Level goes up (which means more Flood Cards could need to be drawn every turn). And, all of the cards in the Flood discard pile must be shuffled and put on the top of the Flood Deck. This means any tile that flooded recently will flood again soon and be sunk and lost from the game. For the players to win, all 4 Treasures have to be captured, all players have to move to the Fools Landing tile, and a Helicopter Lift card must be used to get off the island. The tile sinking element creates many ways for the team of players to lose. Like the loss of the extraction point Fools Landing, gives the players no way to leave the island, or if the Water Level gets too high everyone drowns and the game is lost. If it sounds like there are more ways to lose than there are ways to win, then you’re right! This adds tension to the game and gives it a suspenseful atmosphere you see in adventure movies- Capture the treasure before you die trying! Forbidden Island is fraught with collaborative strategic decision making. And while it’s challenging it’s also incredibly fun! It’s a cooperative game and it teaches teamwork and collaborative strategy. It’s delightfully engaging and exciting. 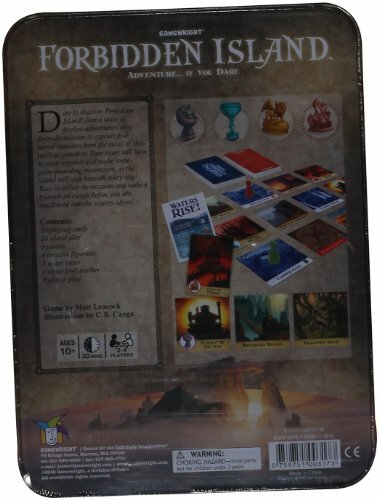 Forbidden Island is quick to play, a game takes about 30 minutes. Its unique tile island makes the “game board” different every time you play. It’s a bit complex and challenging but still easy enough for kids as young as 7 to play and enjoy. This is a great cooperative game! And, I have to say on behalf of my family we loved everything about it. But know, there are many pitfalls in the game, people who are easily frustrated may not enjoy the gameplay because of this. Forbidden Island is a refreshing break from other competitive games. It’s a fun way to get families working together instead of against each other in more cutthroat games. It has lots of flexibility with the adjustable difficulty levels and the ability to create a different board configuration every time you play. While the game says it’s for ages 10+ we think kids as young as 7 can play and enjoy the game. If you’re looking for a great value for money cooperative game that will challenge and excite you family, Forbidden Island is a great choice! Chickyboom Game Review - The Rocking Rolling Roost!